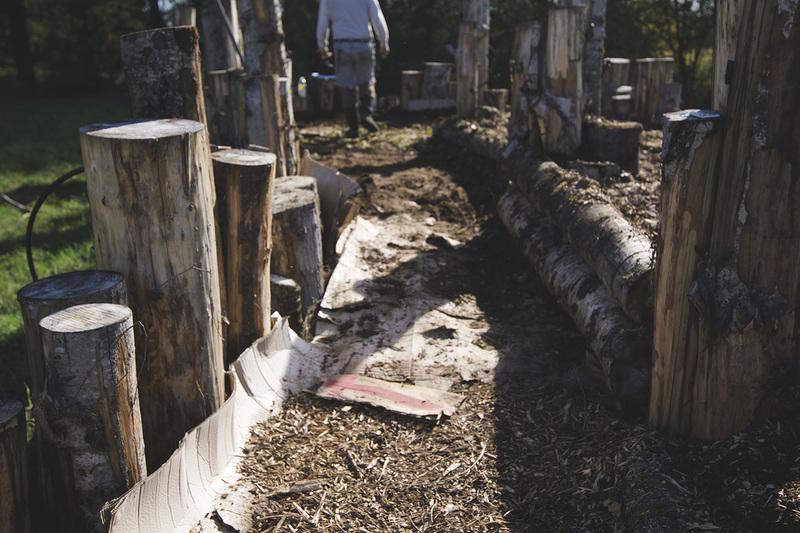 Deston Denniston helps build a Hugelkulture for Steven Giovannoni of Sundog Farm. Photo credit: Kailey Caldwell. “A Nation is made of paper ideas, a country is made of soil and its produce,” Deston Denniston the Director of VETS_CAFE states. 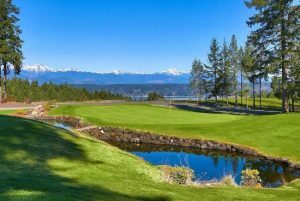 VETS_CAFE, short for “Veteran’s Entrepreneurial Training and Studies in Conservation, Agriculture, Forestry and Ecology,” is due to earn their 501(c)(3) nonprofit status this November after four blooming years of creating more outlets for veterans and sustainable living within Olympia. Their mission statement is straightforward, “training veterans in skills that launch and refine careers in Conservation, Agriculture, and Forestry…” but that is only the beginning. The heart of the programs offered lead to providing veterans with employable skills in sustainable agriculture, conservation, forestry, ecological design/restoration, local sourcing for food, textiles and materials, and overall expanding career path opportunities amongst any and all veterans. 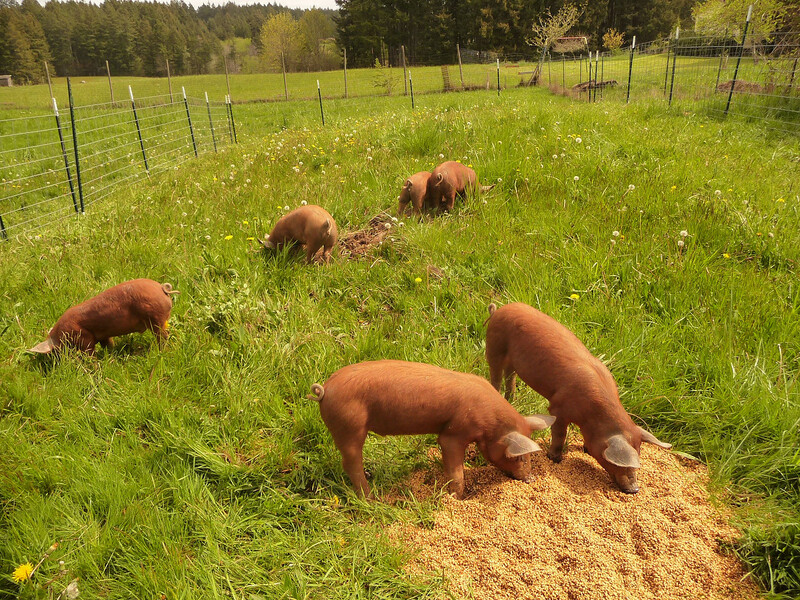 Hogs happily work on their pasture. Hog health is a vital part of farming and producing quality meat. Photo courtesy: Deston Denniston. VETS_CAFE has been operating since 2012 with partners such as Enterprise for Equity, Olympia Meat Collective, Oly Float, and Washington’s Veterans Conservation Corp. 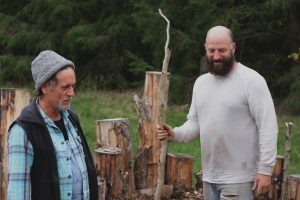 Since then they have directly helped 20 veterans become certified in permaculture design, have assisted in outreach projects helping over 400 veterans in total, and have designed and built three veteran’s farms. VETS_CAFE offers two major areas of study, an 80 hour Core Program in Permaculture Design and a seasonal Livestock Production Program. The next Core Program will be offered in Fall 2017 covering everything from farm design, soil conservation, and restoration to seed handling, full plant surveys, flora and fauna surveys, land forming for prevention of erosion, and natural building with cob and straw. 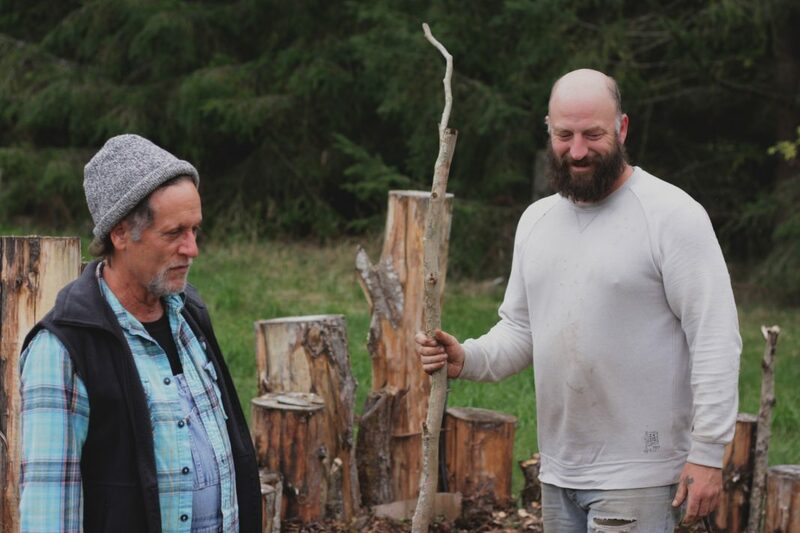 In order for veterans to actualize their aspirations, the Core Program is followed by continued training that connects veterans to academic internships, paid work with local farmers, ecological contractors, green designers, entrepreneurial business incubators, and the US Forest Service. Farmer Steven Giovannoni owns Sundog Farm and has employed many veterans from VETS_CAFE to work on his land. With a bountiful food forest and sustainable living at his fingertips, he has been a longtime supporter of sharing his practices with like minded people. The Livestock Production Program includes seasonal projects such as the Hog Harvest, an ongoing “Pasture to Plate” series. 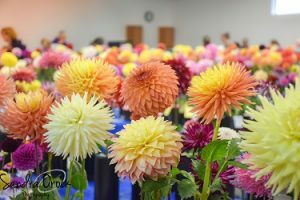 Registration for the next Hog Harvest Program begins in Spring 2017. Classes will start in late spring and go through mid summer. There are a limited amount of hogs available for purchase, so it is encouraged for two or three people to buy a hog together. 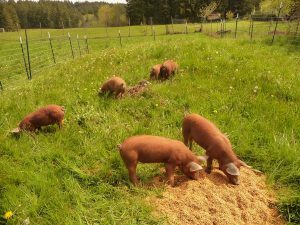 The class will focus on how to use hogs for ecological restoration, pasture rotations and soil management. Participators also learn about swine health and nutrition, fencing and containment, humane slaughter and at the end receive a share of the pork when finished with the butchering and charcuterie portion of the program, since they bought the animal alive. 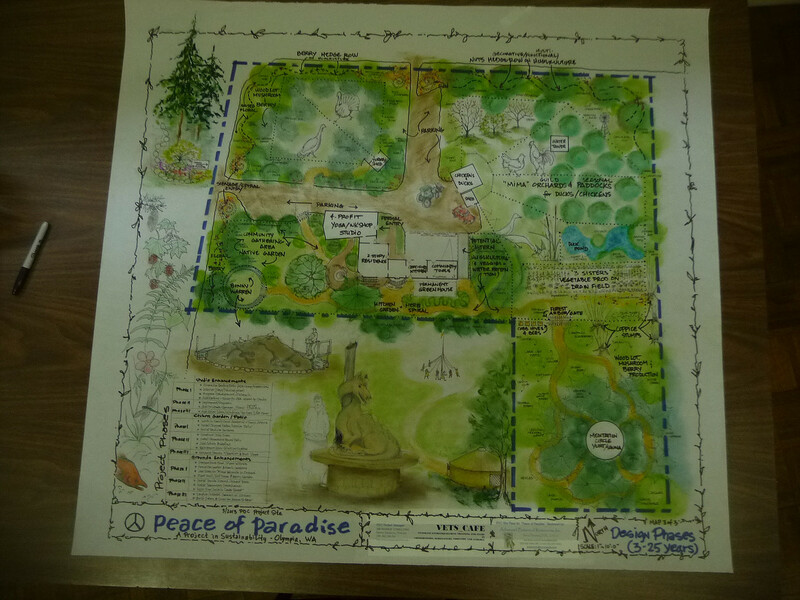 Bernsten’s Peace of Paradise farm design, a large multi crop “kitchen garden.” This farm currently has fruit trees, shrubs, raised beds, chickens and ducks. Bernsten has longterm plans to use this space for VETS_CAFE events and permaculture classes. Photo courtesy: Deston Denniston. “Animal harvest is an important aspect of community. It should be about coming together, and reverent even while celebratory. Not a lot of places allow people to be a part of the slaughter process. Knowing where your food comes from is half the work of making more ecologically sound farms. When people understand these things it influences their choices,” Richard Bernsten, long time participator of VETS_CAFE says. The Hugelkulture on Sundog Farm is a raised bed constructed from wood chips, compost, and cottonwood cut from Giovannoni’s property. This layered design with intricate trenches holds a lot of moisture, making the soil rich and fertile. For more information please contact Deston Denniston. 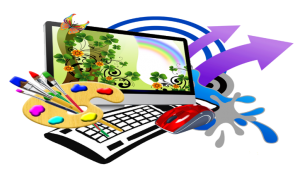 Experiences keep happening, VETS_CAFE is the place to share those experiences and build new ones.